A friend asked whether it is possible to spin the large amount of dog fur that she's accumulated. I spun some samples to demonstrate that it is. I tried it 'undiluted' (centre) and carded 50/50 with merino wool. It actually spun very well on its own. The result is quite fluffy (has a real halo), and it's full of hairs, way too many to try and pull out by hand. 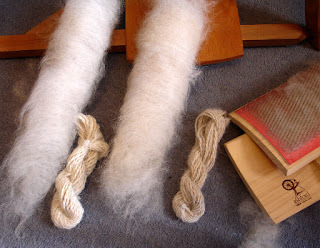 The dog/merino blend is a much nicer yarn, smoother and 'fluffed up' a bit more after washing and setting. 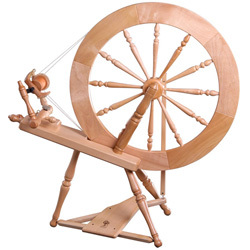 I wasn't aware of spinning it any differently or getting any more air in there, so I assume it's the wool content that's doing that. I wonder whether the hairs on the dog are located in particular areas and whether it's possible to get hairless fur from certain parts, eg the belly? What does it smell like when it's wet though???? I heard someone say it always smells like a wet dog not matter what you do to it!! Interesting to see it done though - bet there are devoted pet owners who might part with money to wear their pet? That's a good question. I'm really not a doggy person, and I can honestly say that while it was drying in my bathroom last night and this morning, I couldn't smell anything. Maybe it depends on the dog.